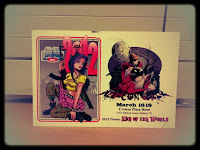 I received my All-Con post card in the mail yesterday and I’m getting geared up. The theme this years celebrates all things apocalyptic, so as the card says “whether you’re into the coming of a savior, total destruction by natural forces, nuclear holocaust, next-age-dawning, arrival of the aliens, or the always feared Zombie Apocalypse” which means tons of costume ideas. I’ve already decided on mine! And I’m not tellin’ either! Do you dress up at conventions or is that just for Halloween? Just a looker or do you like to be looked at? Let me know what your plans are and if you’ve got any photos of years past at All-Con send me photos or send me links!